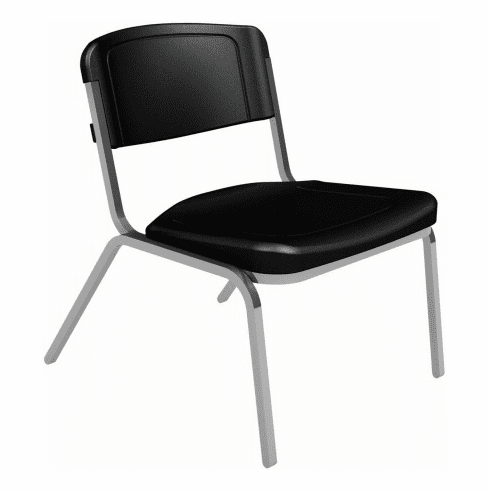 These stackable chairs from Iceberg feature a durable and lightweight blow molded polyethylene seat and backrest that is comfortable and easy to care for. Other features include non marring feet, holds up to 350 lbs., stackable up to 6 chairs high, designed for large capacity applications, heavy gauge, 7/8" steel tube frame, reinforced cross bars on frame and a powder coated gray frame finish. Meets or exceeds ANSI/BIFMA standards. Ships (4) chairs to a carton. Dimensions: Seat Size: 24"W x 20"D. Back Size: 24"W x 12"H. Overall: 27"H x 26"W x 32"D. Warranted by Iceberg. This chair normally ships within 1-2 business days. Price listed here is for one stackable chair.